At 9:30, after breakfast, we left the boat at Baltra and went by bus the short ride to the Baltra airport. Our flight was delayed a few hours but finally departed, stopping in Guayquil and then landing in Quito at 6:30 PM. It's hard to believe that our visit to the Galapagos Islands is over. It was great, but it went by so fast. We still have a few days in and around Quito, Ecuador, which should be fun but much different. 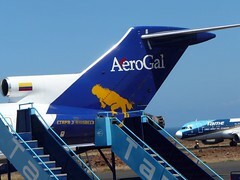 If you want to read about our Galapagos trip starting from the beginning, click here to go to Day 1. Our last day in the Galapagos Islands, we left the boat without breakfast, and landed on the small island of Seymour. Seymour featured sea lions, more blue footed boobies, and some nesting frigate birds. We were able to get a good view of several male frigate birds with the inflated red pouch, and even a few frigate bird babies. We witnessed a territorial argument between two blue footed booby couples, and saw our first land iguana in the wild (not counting the one that crossed our path when we landed at the airport). We boarded a small bus and drove up into the San Cristobal highlands. Like Santa Cruz, the highlands were more lush and green. Our first stop was a tortoise reserve, where we saw tortoises living in a "semi-natural" environment. The project is designed to relocate tortoises to this part of the island. To encourage the tortoises to stay here, they are fed and provided with artificial wallow pools, etc. The reserve had quite a few Poison Apple trees, poisonous to people but delicious to giant tortoises. From there, we went to a nearby lookout for some great views. Later we headed back to the town and went to the museum there, which is very well done, showcases the history of the wildlife and the people of the Galapagos Islands. At noon, we arrived at the town of Puerto Baquerizo Moreno on the island of San Cristobal. Smaller than Puerto Ayora on Santa Cruz, this is the second largest town in the Galapagos Islands. There were a lot of fishing boats in the harbor, and some of the buildings were quite colorful. We first went for a walk around the small island of Loberia (Lobos). There were frigate birds, a few of which were showing the inflated red pouch that the male uses to attract mates. There were also a few blue footed boobies and of course the ever-present sea lions. After the walk, we went snorkeling on the coast of Loberia with about 10 young sea lions. The sea lions were very curious and very playful, swimming around us and and chasing each other in the water. The water was very cold, but I didn't notice swimming with my new friends the sea lions. We woke up in the morning moored off the island of San Cristobal. During breakfast we sailed the short distance to Kicker Rock, which is a huge rock jutting out of the ocean, which is slowly splitting into several rocks. Kicker Rock is also a nesting place for many birds, including frigate birds. We sailing around Kicker Rock and then our boat went right through the gap between the too main rocks, with on several feet clearance on either side of the boat. In additon to the waved albatrosses and blue footed boobies we also saw Nasca Boobies and a couple of Galapagos Hawks. The hawks we sitting on a bush only a few feet away from us, not scared in the least. After the waved albatross colony, we saw a few Nasca Boobies and finally the blue footed booby colony. As the name implies, blue footed boobies have blue feet, though scientists are not sure why. They have a funny looking mating dance in which they take exaggerated steps and do skypointing - it which the beak points to sky while the wings are turned up (see photo). Blue footed boobies are also known for their fishing ability, in which they swoop down from sky and make their bodies as streamlined as possible and dive straight into the water like a bullet, catching fish as much as 3 or 4 feet down. Here they were nesting, some couple had eggs, and other had baby blue footed boobies. As we continued our walk on the island of Espanola, we then came to the waved albatross colony. Almost the entire world population of the Waved Albatross nests here each on Espanola each year. The large birds spend months and months at sea, but return here to mating and raise their chicks. The waved albatross has the largest wingspan of any bird in the Galapagos Islands, as much as 9 feet across. It is a large bird with a bright yellow beak and distinctive "eyebrows". After lunch and siesta time, we landed on a small beach at Suarez Point on the island of Espanola. 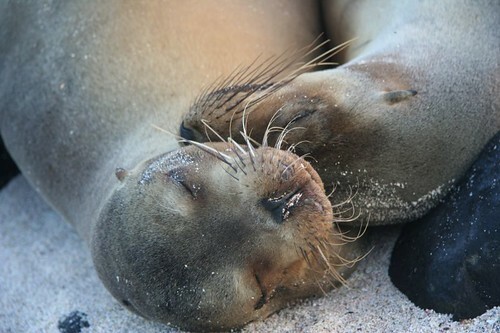 There were a few sea lions there, including the carcasses of three dead sea lions, in various states of decay. The smell was horrible. I ask our guide about, as it seemed like more than a coincidence. To this point, we have seen a lot of sea lions, some of them in large groups -- yet we saw no dead ones. And yet here, on a very small beach, there were three of them. He replied that it was just coincidence. I don't buy that, however. I am sure that is a logical and likely natural explanation for why there are three dead sea lions at this location, but none to be see elsewhere -- I just don't know what that reason is. In any case, I was eager to move on, given the smell. As we walked along, we came across many marine iguanas, but these ones are a little different than the ones we have seen so far. They have prominent red patches on their scales.